Sometimes the changing of seasons can mean changes in your skin. My skin tends to get super dry and flaky once fall is in full swing. My favorite little "secret weapon" is the good ole cooling humidifier. If you run it while you sleep (next to your bed) you will wake up with the softest dewy-like skin! The extra moisture in the air = extra moisture for your skin. 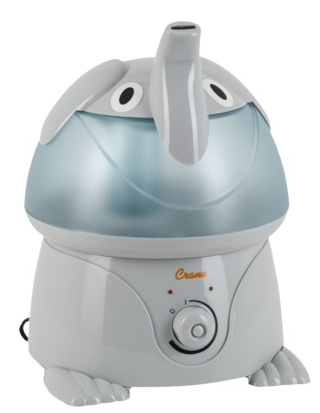 I have also used the humidifier to help heal my four month old's cradle cap and it worked like magic. So if your skin is feeling dry, flaky and in need some major moisture TLC...get out the cooling humidifier! It takes small miracles to keep the fluffiness out of my hair! And I am making your vitamin C serum today! Can't wait to try it. I just ran out of my $50 a bottle one and am hoping I love this cheaper version just as much! Great tip! I need to purchase some new ones this year. This is pretty awesome tip! I have the same one in Kaylee's nursery and we hardly ever use it! A humidifier was the only thing that helped my sons skin when he had really bad excema on his face when he was a baby. That and liquid aloe that I would put in his bottle. My skin gets SO dry in the winter, so I will have to remember this! I never thought to use our humidifier to help with dry skin but I guess it makes sense. Hope you have a great start to your week! I totally have this, except mine's a frog ;) I saw you met Alex over the weekend. I'm so jealous you gals got to meet! This tip is especially helpful if you live in the desert and wake up with skin so dry your two year old gets out his dinosaur book to compare scales. Will try this tonight. I always use a humidifier at the start of winter because my nose always gets dry but never really put much thought into what it did for my skin! Good reminder. Annnd it's adorable. I want to hug it! Haha. Such a good tip Lindsay. I always think of these things for Mila, never for myself! I've recently started making my own cold process soap and my skin is so lovely from it! If you can get your hands on some homemade, cold process soap, try some it's great.